So I showed you this beveled mirror that I got at a yardsale for $10 bucks here! First, I covered the mirror with newspaper and taped off the edges. Then I spray painted it my favorite color – Krylon Oil Rubbed Bronze! But I wasn’t done yet! :) It was little too dark and I wanted to make it look more like an antiqued bronze and accent the detail on the frame. I thought I was going to use Rub n Buff and bought a tube of Antique Gold from Michaels. But it was too hard to control how much I was applying and the color I was getting. I didn’t like it at all! So on to “plan B.” I had some leftover craft paint in Antique Gold that I had used on a stencil project in my dining room. I knew I could control the color and the application a lot more. I put a little on a brush and dabbed most of it off on the plate. Then with the little remaining on the brush, I just brushed it on very lightly, trying to hit all the raised areas to accent them. Perfect!! Just the look I was wanting! I really love the way it came out! 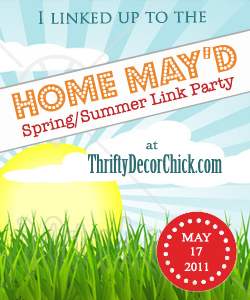 Don’t forget, the FIRST EVER Décor on a Dime Linky party is COMING here at Centsible Savings! Be back on the 15th (Sunday) to join in with your projects and see what everyone else has been doing! FREE chips and queso at Chili’s! Looking for some great fall wreath ideas? Need some chicken ideas for supper? Giveaway: Surprise Swagbucks Amazon gift card!! Back to School sale at Personal Creations! FREE pizza Stevi B’s TODAY ONLY! $25 for $50 certificate to Gap –TODAY ONLY! Sign up for JCPenney coupons + more! Décor on a Dime party coming on Sunday! Sunday coupon preview - 3 inserts this weekend! Hot deal on shoes at JCPenney.com!! My secondhand deals of the week!